You can enjoy the convenience and great taste of draft beer anytime and almost anywhere inside or out, thanks to Marvel's complete line of draft beer dispensers. It's the ultimate in home entertaining, style, and luxury: fresh, cold beer, wherever and whenever it's needed. The Marvel Draft Beer Dispenser line hides kegs from sight while keeping them cold. This model can be used for both Undercounter or freestanding applications. To dispense two kegs you will need to use 5 Gallon Kegs. 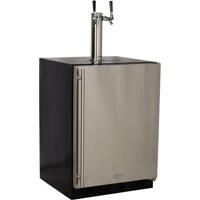 This kegerator can also accommodate either a half or quarter keg. The Marvel ML24BNS1RS-X2D features a black cabinet with a stainless steel door and is designed for inside applications only. This two product kegerator comes with the BeverageFactory.com X-CLUSIVE double faucet stainless steel draft tower, two D system sankey keg couplers, a Premium Pro double gauge two product CO2 regulator, a 5 lb CO2 tank and all the hoses and washers necessary to dispense two kegs. Comments: This kegerator is awesome. The stainless front looks fantastic. By adjusting a jumper switch (instructions available from the manufacturer) the temp can drop down to as low as 20 degrees F. It comes with shelves that you can use and store bottles/cans in it when not using it as a kegerator. Plus not only will it hold two sixth barrels, it also will hold one quarter barrel and one sixth barrel with the shelf supports removed. Its a tight fit, but I was able to put that combo inside of it. The taps, regulator and tank that come with the package are also high quality. Overall it is worth the money. I installed mine under a granite counter and drilled through the granite for the hoses. Couldn't be happier with this one!